Japan Airlines has repainted one of its domestic-use Boeing 777-200s (registration JA8984) to promote the company’s support of preservation-minded causes. The plane, dubbed JAL Eco Jet “Nature”, is adorned with the logos of three organizations supported by the airline: United Nations Decade on Biodiversity, an international effort to promote biodiversity around the world; Sanriku Reconstruction National Park Initiative, established by the Ministry of Environment of Japan to build a national park on land devastated by the tsunami in March 2011; and Tohoku Cotton Project, meant to restore agriculture to land that was washed out by the tsunami. There is another logo which reads “JAL supports Tohoku and Tohoku Cotton Project” and finally JAL’s new “Sky Eco, In harmony with Earth” logo. 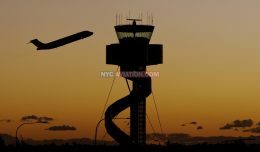 Unfortunately, if you’re outside Japan, you probably won’t get to see this plane, as it’s mainly operated on domestic flights between Tokyo (Haneda) and Fukuoka, Osaka (Itami) and Sapporo. It was previously painted in a slightly different Sky Eco paint scheme. After 25 years, Southwest Airlines and SeaWorld are ending their marketing partnership. 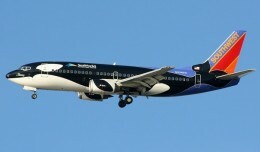 Under criticism from animal rights activists, the airline will repaint all three aircraft painted in the special "Shamu" color scheme. 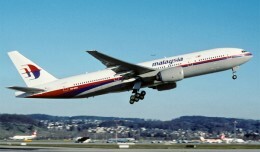 Malaysia Airlines has lost contact with a 777-200 flying from Kuala Lumpur to Beijing, carrying 239 people. 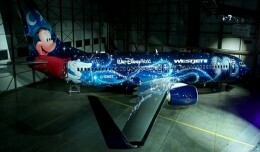 WestJet unveiled the "Magic Plane", a Disney-themed 737-800.